The funny proof that school is nothing to be scared of! (Even if you’re a kid at a school for monsters. Or the other way round.) A boy and a little monster accidentally swap schools on their first day. At the School for Nice Boys and Girls, the monster has to sit still, be quiet and wait in line. And over at Monster School, the boy is having lessons in custard pie attacks, counting bogies and sharing yucky smells! This is not what either of them expected. They’re shocked, then bewildered, then horrified. But as the day goes on, each of them learns that school (for kids and monsters) can be heaps of fun! 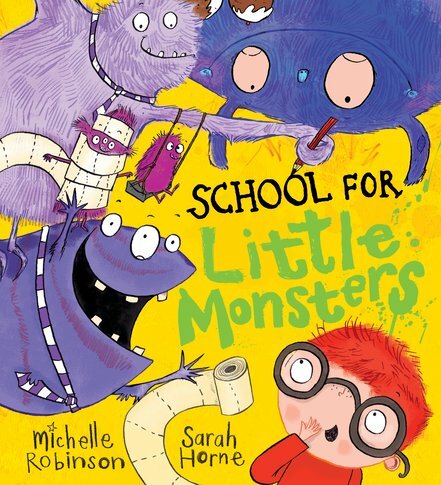 Funny, reassuring and cheeky – great for little monsters!